Originally a private club, Carlisle Bay opened as a hotel in December of 2003 after becoming part of the CampbellGray Hotels collection. It has an urban boutique hotel's intimacy, but basks in the Caribbean sun on a deep, beach-lined cove on the south coast of Antigua. Each of its 82 suites faces the ocean, putting every guest just steps away from digging their toes in the sand or taking a dip in the warm, calm waters. That Caribbean ideal aside, Carlisle Bay deserves to turn up on tennis players' radars, at least on paper, for its relatively large complex of courts: 9 for just 82 rooms, which I believe gives it the best court:room ratio in these islands. Adding to its appeal is Antiguan-born PTR-certified pro Kenneth Gonsalves-Barreiro, a former ranked junior here on Antigua now enthusiastically working to make Carlisle Bay a haven for tennis players, both adult and junior. It takes about 25 minutes to drive from the airport outside St. John to Carlisle Bay. The route along a spider web of narrow two-lane roads weaves through a landscape of small Caribbean homes and an occasional farm and through hills lush with tropical trees and flowers. Small yellow Antiguan mangoes litter the roadway in places, and roadside stands sell sweet black Antiguan pineapples, bananas, and other locally grown tropical fruits. Development is sparse and generally low profile, leaving vast parts of the island green and unspoiled. There isn't a highrise tower to be seen anywhere. Antigua's fame attaches to its beaches—365 of them, "one for each day of the year" their slogan goes—and to its deep, protected harbors. Cruise ships dock at St. John's, disgorging passengers at the duty-free shops of Heritage Cay and then on into the capital city's narrow streets. The West Indian town can be raucous during the nine days of Carnival that begin in late July but the island is otherwise inhabited by conservative West Indians, whose many churches—among them the handsome twin-towered St. John's Cathedral—play a significant role in their lives. Away from St. John's, historic anchorages like English Harbour (site of a 1789 fort) and Falmouth attract avid sailors and mega yachts, especially during Antigua Sailing Week in late April. Tennis has a long tradition on Antigua. In 1975, before Carlisle Bay came into existence, three hotels banded together to sponsor the island's first tennis week. 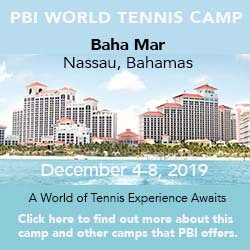 Originally a stop on the men's professional tour—the late Vitus Gerulaitis won the inaugural event—it focused attention on the island's love of tennis and began a tradition of actively promoting this eastern Caribbean landfall as a tennis destination. Over the years it has evolved into a pro-am headlined by Fred Stolle and headquartered at Curtain Bluff, which is just over the hill from Carlisle Bay. Given that history, Gonsalves-Barreiro's goal has been to increase Carlisle Bay's profile. "My biggest challenge is that guests only find out about tennis once they arrive," he laments. In an effort to draw more attention to the courts he has added Quickstart for kids and Cardio tennis (complete with heart monitors but so far without music) to a weekly calendar that otherwise includes a couple of round robins and clinics and lots of private lessons. "The English (who make up a 60 percent of the resort's guests) prefer individual to group lessons, unless it's for their family," he told me. A couple of mothers I spoke to praised his work with their kids, citing how enthusiastic they'd become about the sport and how much fun they were having. He has racquets available free of charge, for children and adults alike. Courts & Fees. Although the resort puts the court count at nine (eight hard, one artificial grass, four with lights), one has no net, so I give them credit for only eight. Each individually fenced, the courts are arrayed on three sides of the spa and fitness center and bordered by tropical foliage that ranges from manicured to unruly. There is nominally a pro shop—that is, a room with merchandise labeled "Tennis Pro Shop"—however, it does not actually have anything related to tennis, not even tennis balls. You will instead find lots of clothing for kids. Gonsalves-Barreiro compensates by providing racquets and a collection of used balls for guests who haven't brought their own, and he can restring your racquet on site. Court Fees. None for guests. Caveat: Bring your own tennis balls (unless you like playing with used ones), and be sure to pack wrist bands, overgrip, and hats or visors. Beach. Dotted with coconut palms and a few seagrapes, the beach at Carlisle Bay runs the length of the property. Calm, shallow waters lap at the sand, and lounge chairs covered by gray towels hunker beneath white umbrella tables. Staff circulates through taking orders for drinks, snacks or lunch, or afternoon tea. There's a watersports center and dock at the east end for windsurfing, sailing, kayaking, or snorkeling (though you'll need to take a boat ride out to Cades Reef for see anything). No motorized craft are permitted other than the resort's boats, so it's a great place to swim. Need Antiguan souvenirs? There's a gray shack adjacent to the watersports center (and Jetty Bar), where Antiguan women sell local crafts. Spa & Fitness Center. Located amid the tennis courts, a two-story gray clapboard and white-stucco building houses the Blue Spa and a fitness center. The modest spa offers a variety of treatments from Natura Bissé in its six second-floor treatment rooms, as well as tiny locker rooms with saunas and plunge pools. The air-conditioned fitness center, also on the second floor, stands out for its TechnoGym equipment and windows on the mountains and tropical foliage. Personal trainers are available. Yoga and Pilates, meanwhile, have their own open-air pavilion in a clearing beyond the courts. And ... Bicycles are available for use (remember to ride on the left), and guided hiking tours are available to places like Signal Hill, where you can see much of the island. You're on your own if your guide breaks open the pod of a locust fruit (hymenaea courbaril)—a.k.a., "stinky toe fruit"— and offers you a taste. After originally debating whether to even allow children, Carlisle Bay has gone in the opposite direction, opening a Cool Kids Club for those age 6 months to 12 years (free to those age 2 and up) and offering supervised activities throughout most of the day (and optional babysitting at night). They also screen kids' movies every afternoon in the screening room. Tennis is one of the sporting activities for those ages 7 to 12, and Gonsalves-Barreiro offers Quickstart tennis (with a portable low net, soft tennis balls, and accessories like a balance board) for those just taking up the game. Accommodations range from very spacious (780 square foot) Ocean Suites to three-bedroom Carlisle Suites with full kitchens. All directly front the ocean. The newest are the Garden and Ocean Suites, stacked in a series of three-story buildings that trail along the beach east of the swimming pool and lobby. Technically junior suites, these two-tiered rooms have a kingsize platform bed on the upper level about 14 inches above a sitting area with sofa, satellite television, CD/DVD player, desk, and armchair with ottoman. A deep terrace facing the sea runs the full width of the room. The bath is similarly spacious, with separate tub and shower (both with views of the lagoon, farm, and mountains behind), twin sinks and closets, and a Gaggia espresso maker and electric kettle. Free WiFi access is available there and throughout the resort. The sleek decor would be right at home in an urban boutique hotel but you only have to glance out the window or step onto the terrace to know where you are. There are three principal restaurants: Indigo on the Beach, which is open for breakfast, lunch, and dinner; Ottimo, a poolside Italian restaurant; and East, which opens for dinner only. The open-air Indigo is notable more for its views of the ocean than its cuisine, though items like its Antiguan roti and tuna tartar are exceptions. Ottimo! has an authentic wood burning oven for its signature pizzas with with home-made gelato for dessert. East, located off the open lobby behind carved wooden doors, melds Thai, Chinese, East Indian, and other Asian cuisines, oddly dumbed down to my taste at least, leaving me to wonder, "Where's the spice?" See the website for the specific rates and specials applicable to dates you plan to travel. Seasons. Carlisle Bay is open from early October to late August, closing for six or seven weeks late summer/early fall. Travel Instructions. VC Bird International Airport (ANU) has direct flights from several cities in the U.S. and Canada and from London in the U.K. There's a departure tax of $20, payable at the airport. General Tourist Information. For general information about travel to Antigua, visit the Antigua and Barbuda Tourist Office website or contact them in the U.S. toll-free at 888-268-4227 or in the U.K. at +44 (0) 20 7 031 8161. Citizens of the U.S., Canada, and the U.K. must have a valid passport and return ticket but do not require visas. Residents of other countries should contact the Tourist Office for details about other requirements. Here's what others have had to say about Carlisle Bay.